Casa Los Dos is located on the famous and beautifully situated street, Acequia Madre, which parallels the famous Canyon Road. It is in a prime location in the historic Eastside, and walking distance to Geronimos, El Ferol, Caffe Greco, and all art galleries. In addition, you can walk to the Plaza or take the quick 5 minute drive anywhere downtown. 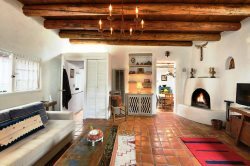 This historic 1930’s home has been painstakingly remodeled and won “Best Historic remodel of 2015” presented by the city of Santa Fe. It consists of the main house, which has 3 bedrooms/3 bathrooms, plus a fourth bedroom with a Trundle bed ideal for kids. The Casita is a full 2 bedroom/2 bathroom home complete with kitchen and washer dryer. The entire compound sleeps 10 comfortably, and has 2 kings, 2 queens, 2 twins, and a trundle bed. There are beautiful outdoor patio spaces for relaxing and entertaining on both the main house and the casita. Casita guests can have a totally private experience. The layout is perfect for families or couples traveling together. The main house has a top of line kitchen, with Wolf and Subzero. The Casita has a full kitchen as well so parties can join together in the main house or have separate kitchen facilities. The overall house and casita are almost 4000 square feet of indoor living space, plus spacious outdoor patios, including a front porch. There is a 2 car garage (rare on the East side) and a carport that doubles as a covered patio space. There is also tons of parking! Indoor and outdoor fireplaces make for a cozy and authentic Santa Fe experience. Experience the best that the Historic Eastside has to offer with this fabulous compound walking distance from the best parts of Santa Fe. Enjoy your stay at the lovely Casa Los Dos and have an authentic Santa Fe Experience!! We felt at home from the moment we entered the house, perfectly appointed and delightful inside and outside! Great property. Very clean and well equipped. Everything went so well we really did not have to "work" with your team. Everyone in our group of nine loved the property and enjoyed the four night stay ..... wished it could have been longer. Beautiful house.